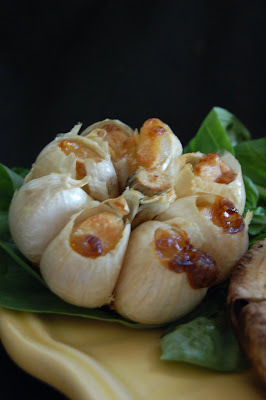 mmm drooling over that roasted garlic! I love mushrooms too, pretty much any way, any time. I have never had them stuffed with ricotta, though: it sounds like a very nice idea. I would make myself a meal out of those! Fantastic recipe! Have you given up meat for good, or just for the short term? Either way, congratulations on a thoughtful approach to dining. Am I ever busy! 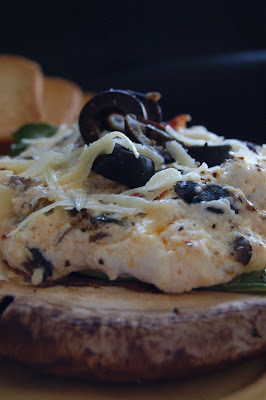 This recipe looks great - - ricotta again -- isn't it great in just about everything, both sweet and savory? I agree with Peabody - this is a meal, except that my husband would want meat. And yes, BC, ricotta is amazing and versatile. It looks lovely - but mon mari would want the meat, too. And I can't get such big mushrooms.... so we'd have to have lots more LOL! Wow Jan this is a lovely one to add to my growing list of how to make a mushroom into meat! 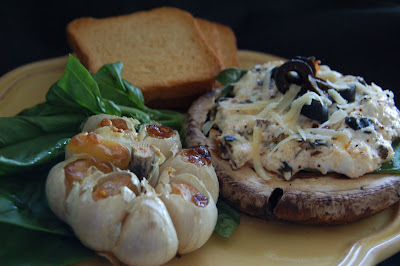 We're really great fans of the big mushrooms and how can you go wrong with that roasted garlic. Wonderful dish. Beautiful plate, Jann! The mushrooms and the roasted garlic I mean. I'm a huge fan of both. As you may have guessed from my blog's silence, I'm waaaay too busy these days. I get 6 weeks off this summer and can't wait. I do love stuffed mushrooms would would eat it often but alas, we only get the imported variety and it is not always regular and then the price is usually ridiculous. Love roasted garlic and meaty mushrooms. We're trying not to have so much meat but all credit to you for cutting out fish and chicken too. I'm not an experienced cook but I am definitely going to try this!